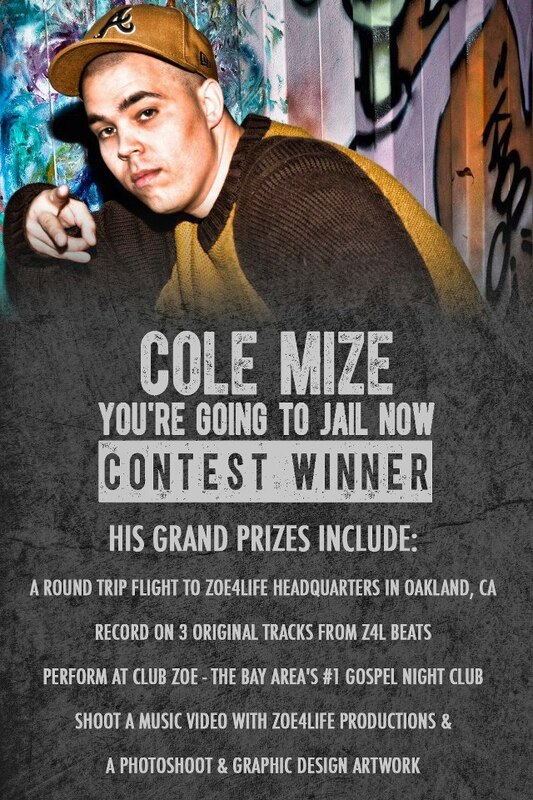 Cole Mize recently entered into another rap contest called “You’re Going to Jail Now” (ft. Dan tha Man) which was hosted by Zoe 4 Life studios in Oakland California. He ended up winning first place amongst 60 other artists and won a trip out to Oakland! We will be writing a blog shortly to share his experiences in Cali. This music video has also received major publication by being featured on DaSouth.com and earned the #1 spot within one week of being published for most viewed music video. Cole Explains, “You may be wondering what in the world could I be talking about with a title like “You’re Going To Jail Now”, especially since I have never been to jail before. What’s funny is that I asked my self those same exact questions when I first decided to write to a theme about going to jail. Then it hit me to write about a time that I was probably closest to going to jail….. so that’s what I did. Please allow me to paint a short picture for you. About 1 1/2 years after I gave my life to The Lord I went bowling with my female cousin Ashley & my best friend Monica who would later become my wife. After we got to the bowling alley we bowled a couple games and then went and played pool. About mid way through our game a guy who was hanging out with several other males, comes up and starts making inappropriate comments to Monica and then proceeded to take pictures of her backside with his cell phone while he said and I paraphrase “Daaaaaang girl, how’d you get in them jeans?”.